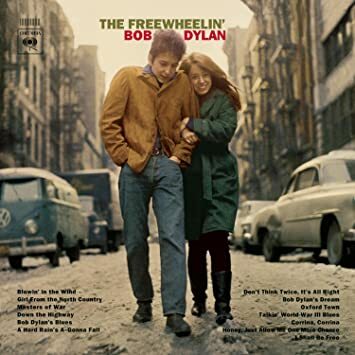 On the cover of Freewheelin‘ both Suze and Bob look a little chilled. Suze is curled up next to him leaving no space in between and Bob’s got his hands in his pants pockets. He also has the buttons up top buttoned, the bottom two are opened, and if you look close you can see a lilt to Suze’s hair, the wind seems to be blowing towards them, not behind, on this two way New York Street. Suze is looking at the camera; Bob’s eyes are directed at the ground, looking for that “restless piece of paper . . . that’s got to come down some time . . .”? Bob also said that you got to feel it in the wind, this elusive answer, that is forever blowing, or forever just beyond our grasp or evading our sights. What we can see or hear are the terrific rhymes; the pattern is consistent, and it keeps the song easy to hear and pleasing to the ears. The rhyme scheme is a/b/c/b/d/b/d/d. Easy as a, b,c. Let’s stick with that last one a bit. There are only two things that can be heard in this song–the cannonballs flying in verse 1 and the people crying in the last verse. Oh, and a third, the wind, you can hear the wind blowing, and you can hear Dylan, singing above it, singing into it, breathing life into a song that is a beloved anthem to the power of questions for protest. 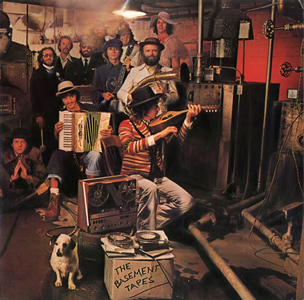 This is a hoot of a song, hootananny-ish, front porch knee slapping music, as are most of the Basement Tapes songs. Christoper Ricks feels “rough-riding energies” in them. They’re where a “raucous raunchy world come alive” for him. “Apple Suckling” fits that bill well. All the sexual innuendos are there if you want them to be. And like Shakespeare in his darker comedies, Dylan, seems to revel in their bawdiness. The rhyming instigates sing-along, playfulness, and spontaneity, but it’s more controlled when you see it on the page. The first verse set an a/b/b/b pattern, if you toss aside the “Down there”‘s and “Oh yeah”‘s. The bridge, repeated just once, maintains the ee assonance. And Dylan shifts to pure assonance again in verse three with a series of long i sounds with “line” repeated and ending with “time.” The final verse, has a rhyming life of its own with an a/a/b/b rhyme scheme. The song is framed by rhyming patterns that “come alive” on their own–of their own. There’s a delightful melodious uumph to the song, overall, pleading with each listener to join in. And why not do so now, with the “rough-riding energy” of pirated music from Dylan’s latest bootleg release. Who knows how long this will last. As with all of the Basement Tapes songs, grab these good times while you can. Now, who’s on the table, who’s to tell me? Who’s on the table, who’s to tell me? Who should I tell, oh, who should I tell? “Hard Rain” is interesting for its lack of rhyming. Many of us might associate it with poetry and presume rhyme is central to its memorable sound, its cadence and repetition carry it along in a sing-song fashion, the kind we may associate with folk and ballad. And then when we hear the likes of Allen Ginsberg speak of it on No Direction Home as a the work that passed the poetic baton from one generation to the next, so rhyme might just be what we assume to characterize such a momentous transition. Ginsberg even says he wept the first time he heard it. “Poetry is words that are empowered to that make your hair stand on end,” he says. And this Dylan song does do exactly that to the tuned in listener willing to really take in and on the accumulating images of beauty become wasteland. Where is the first question, what did you see and hear, who did you meet, the questions that follow, all asking something about the past. The chilling, hair stand on end question is “What will you do now”? for instance, contains the shaky assonance of “roar” and “world.” And Dylan knows how he can sing, pronounce them just for the right unity. Some of it is from repeated words, where, where, where . . .and some internal, “a-goin'” and “a-fallen'” and some alliteration, “people,” “pellets,” “poison,” “prison,” and one now terminal, the best rhyme “hidden,”/”prison.” It’s not perfect, “s” vs “d” prevent that, but the double assonance of “pris” with “hid” and “on” with “en” is magnificent, while it also creates the chilling image and perhaps a major theme with “hidden prison,” the one we live in that is our body, the one we can’t see but live in everyday, the possibilities are endless. This song is a work of art. Here is the Live at Town Hall live version audio from 1963. Dylan last sang this song just this past July–he knows his song well now, knew it then, and he keeps singing it. It stands out in this way, and for me, it stands out as the most entertaining of all the verses. Over the line, (get over the line already!) over that “Walkin’ down the line” line is a rhyme that awaits that won’t merely repeat. The pattern works–it’s bluesy humorous.